When I picked this up in 1999 I had already utilized a few different fuzzes and distortions. But I needed something that bridged the gap from the amp’s base tone and the giant gain/volume assault of the Rat and the gale force fuzz of the Muff. This guy was it. I wanted 1 step up in volume and gain but got 2! 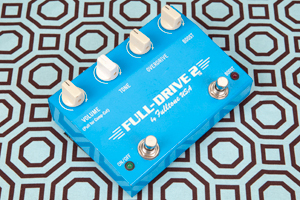 For those rare moments that required more civilized or articulate playing that could still cut through the cymbal wash. Not only does the Fulltone Full-Drive 2 offer a broad, musical range of drive that comp feature has proven invaluable. These pedals are also quite durable. At the time I was known to leap of off bass drums onto my pedals. You know, to visually illustrate the big sonic blast on the One. Few pedals survive such extreme use cases. This aqua beauty has done so admirably. Although, I have needed to replace the proprietary switches twice. Not bad for 18 years of constant use.